Hungrytown are Rebecca Hall and Ken Anderson, a husband and wife duo from Vermont. The pair played a delightful unplugged set at Hector’s boathouse bistro in Farncombe. Originally the duo lived in New York but gave up the city life to move to a quiet part of Vermont “a small state with big snow” to pursue their musical dreams. They play up to 150 shows per year. When they tour America they have their trusty camper van with them with almost 300,000 miles on the clock, in England they have the “luxury” of small hotels and a hire car. 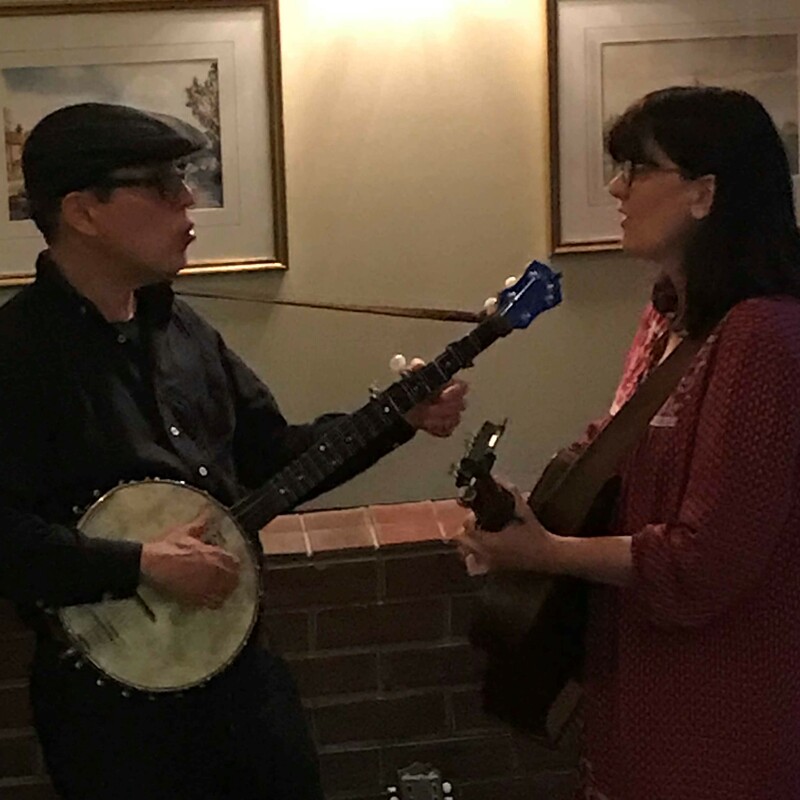 Playing a set with no amplification and mainly of original material the duo calmly entertained the audience with their gentle melodies, well-honed harmonies and charming repartee. Rebecca writes most of the material on the couple’s latest album Further West, takes lead vocals and plays guitar. She has a lovely, confident folky voice which Ken compliments perfectly with perfectly harmonised backing vocals. He plays banjo, guitar and mandolin with aplomb. The name Hungrytown and the track Hungrytown Road derive from a road Rebecca and Ken noticed in the Blue Ridge Mountains of Virginia when they were recording with a group of bluegrass musicians. They kept passing this gravel road, which they eventually followed. It led to a log cabin and a church but ultimately was a dead-end. Beautiful songs beautifully performed complimented the cosy boathouse atmosphere perfectly. A standout song was Static, another from the latest album, a track about long road trips in America, of which they have considerable experience in their camper van. Other numbers included Lucille Lucille, November Song, Hard Way To Learn, Don’t You Let Me Down and the gentle singalong Sally Lazy. Impressively they sang two numbers a cappella, firstly a gorgeous version of Woody Guthrie’s Pastures of Plenty and they finished with The Sweetest Flower from the Any Forgotten Thing album.